Welcome to the updated New Zealand Bridge website: you should notice a few improvements. If you register once1 on the My NZB page using your NZB Computer number your Masterpoints will appear automatically each time you visit the site. Once registered you’ll automatically see your progress on the Home page. To see your detail and history (or someone else's) click on the View all results button on the middle of the Home page, or click the Masterpoints menu on top right. 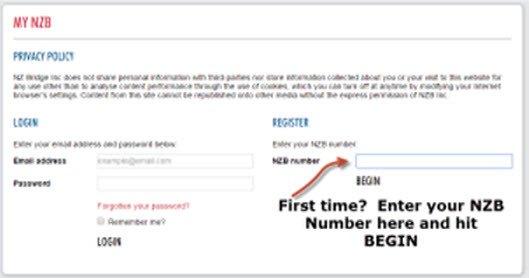 On the My NZB page if you are arriving FOR THE FIRST TIME you need to enter your NZB Computer Number on the right hand side of the screen: then your name should pop up automatically on and you can add the other details requested. And click the "Remember me" box so that you don't have to re-type your details each time you log in. If you have not registered please do not enter your email and password since the system will reject you if you have not previously registered. A few people have asked why we bothered to introduce passwords. We have received queries about some situations. On registering the system asks me for my password, which I do not know. If registering you are telling NZB what you want your password to be: if you are registering you do NOT already have a password and therefore the system does not know it and cannot send you an email message as a reminder. Password reminder: if you have not registered using your NZB computer number, there isnt any point is clicking "Password reminder" since the system only recognises you AFTER you have registered. Note 1: For those of you with multiple devices like telephones and tablets, you'll need to LOG IN with your user name and password on the second and subsequent devices.